Are you starting a new venture or wanting to get your existing small business up to date with modern technology? Have you thought about how you will tie all your networking needs together? Figuring out your network management systems as you go along can be crippling for your business. Statistics prove that IT infrastructure failure can cause massive financial losses for businesses of any size, but there are also intangible losses that can occur due to system aberrations. Decreased employee motivation and declining customer satisfaction are two of these which can have detrimental long-term effects. Read on to find out 8 ways that managed network services can benefit your business. To stay competitive in an increasingly technological world, every business owner needs to keep up with the times when it comes to IT-related services. You need to get these systems implemented and keep them functioning optimally to survive in the modern business world. With rapid changes almost daily in the IT-sphere, this can get costly and confusing. Managed network services relieve you of the pressure to keep up. Your service provider will ensure that your business is employing the latest technologies and equipment, and keep you informed with strategic advice to keep your business moving forward. Managed network services relieve you of the pressure to keep up. Your service provider will ensure that your business is employing the latest technologies and equipment, and keep you informed with strategic advice to keep your business moving forward. In this way, your small business can remain competitive against large companies by accessing the same infrastructures that they are managing in-house. Specialist hardware and software are an expensive investment. A managed service provider will offer you a tailor-made solution up front and set it up. However, the costs are spread over the contract term reducing your initial outlay substantially. Your IT service provider may even be willing to implement a pay-as-you-go plan to help accommodate for fluctuating business needs. Managed network services allow you to pay only for what you use. You don’t need to cough up wages for a team of IT staff when you don’t need them, but when you do need help, you can get it fast. This can save you immensely on hiring and training specialist IT technicians. With a fixed monthly payment, you can budget effectively without having to worry about unexpected extras. The all-inclusive price will usually include proactive management as well as reactive service and support. Multiple IT services can be streamed over a single connection to reduce your infrastructure costs. This enables remote staff to easily and quickly access all the functionality of your servers, including voice and data applications, without incurring extra expenses. Centralizing your services ensures that your computing services are as efficient, smooth and fast as they can be. Hiring IT staff can be difficult, especially if you don’t have an IT background yourself. Managed network services have got that covered with an expert team of experienced, diverse and qualified personnel at your fingertips 24 hours a day. Your managed service provider will also ensure that their team are well versed in any relevant policies and have all the necessary documentation to perform installations for you. Constant vigilance on the part of your managed network services provider can save you on downtime by pinpointing problem areas timeously and acting swiftly. Likewise, vital upgrades can be implemented quickly and effectively at little cost to you ensuring your business continues to run optimally during the process. No training is required when new systems are put in place and you don’t have to waste time and money researching and implementing your own improvements. Your employees can benefit from time-saving updates and measures to improve productivity immediately. With all your complex IT decisions taken care of, you are free to focus on growing your business. No matter what happens, your data and IT resources are safely centralized in an off-site location with cloud backup. All your service reports, performance information, job tickets and even call logs, are safe and secure with a managed service provider. Even if your main office is lost due to a natural disaster, the show can go on with very little interruption. Risk is inherent in owning any business. Many factors can contribute to this, such as new government regulations, altered economic conditions, changing technology and fluctuating markets. Managed network service providers reduce these risks to you substantially thanks to their up to date industry knowledge and resources. This can be particularly relevant in the realm of changing industry policies, security and environmental compliance issues. Technology changes rapidly – leave it the experts to stay on top of it for you. Anything that affects you will be earmarked immediately and corrected if necessary. A security breach can be fatal to your business, but compliance and security measures are vital for protecting your clients’ confidential information too. Your managed network service provider will save you the devastation of an attack by hackers with a secure firewall, workstation audits, and rigorous PCI security standards.A good service provider will know how to keep your clients’ payment information 100% secure. Get in touch with us for all your network management needs. We are dedicated to providing you with all the fast solutions, cost-saving benefits, and added security of a managed system network. 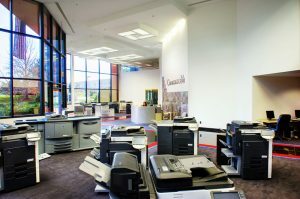 From printers to cloud services, and new installations to office migrations – we’ve got you covered.